Built with pride by IAM members in Wichita, KS, Hawker Beechcraft’s AT-6 Light Attack and Armed Reconnaissance aircraft supports more than 1,400 jobs across the U.S. The IAM was quick to welcome news that the U.S. Air Force was setting aside a $355 million contract award for a Brazilian company to build light-air support aircraft for use largely by U.S. and NATO forces in Afghanistan. The initial contract announcement triggered a joint effort by the IAM and Hawker Beechcraft to urge the Air Force to reconsider the U.S.-built Hawker Beechcraft AT-6, which would sustain over 1,400 U.S. aerospace jobs, including those of hundreds of IAM members. 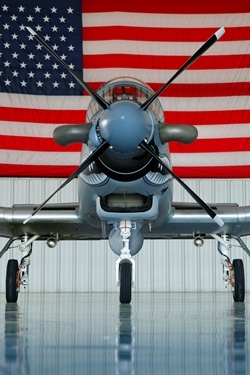 “Over the past year, our legislative department worked with Hawker to point out to Congress the benefits of the AT-6 and the problems with the way this contract was awarded,” said Southern Territory GVP Bob Martinez, who praised the AT-6 as a proven performer. While the Air Force raised serious concerns over the bidding process that resulted in the award to a Brazilian aerospace firm, it has yet to announce guidelines for a new competition for the contract.